Preheat oven to 400 degrees F (205 degrees C). Butter and flour an 9 inch (23 cm) spring form pan or 8-inch square pan, and line the bottom with parchment paper. In the bowl of your electric mixer (or with a hand mixer), beat the eggs and sugar until thick and lemon colored (about 3-5 minutes). Add the melted butter, milk, vanilla, and lemon zest and beat just until incorporated. Add the flour mixture and stir just until moistened. Gently fold in the whole pitted cherries (not the cherries that you have halved for the top of the cake). Pour the batter into the prepared pan, smoothing the top. Bake for 15 minutes then remove from oven. 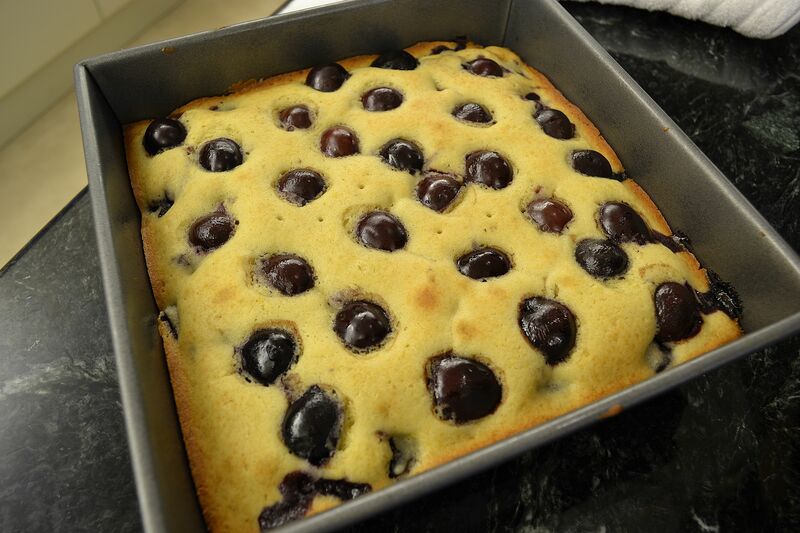 Quickly arrange the remaining cherries, cut side down, on the top of the cake. Return the cake to the oven and bake for a further 20 minutes or until golden brown and a toothpick inserted into the cake portion comes out clean. Remove from oven and place on a wire rack to cool slightly; serve warm or at room temperature with a dollop of softly whipped cream.